I'm using with backpack sprayer/blower. how large of a yard will this cover for barrier treatment? The exact amount of coverage depends on how it is mixed. I recommend to mix it no more than 2 oz per gallon of water. This way, the 32 oz bottle will yield 16 gallons of mix. 16 gallons of mix should adequately treat around 8,000 square feet of yard or soil at 2 gallons per 1000 square feet. This may be a little too much mix depending on what you are spraying. If you spray at 1 gallon per 1,000 square feet, then it will yield 16,000 square feet. 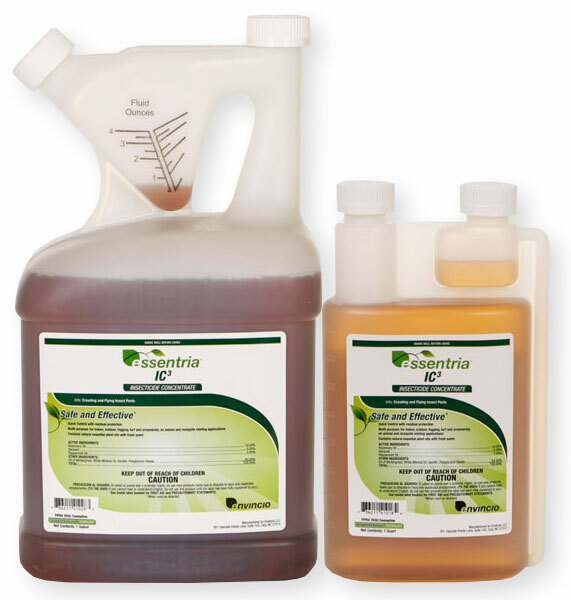 This product requires slightly more mix per 1,000 square feet than a typical pesticide. Also, beware that Essentria under the right conditions such as heat and drought can cause a burning effect on plants. It is essential oil based. The essential oils will cause burning under these conditions. If in doubt, spray less and see what happens. You can alway make it stronger and re-spray.